Greetings from Lushoto, Tanzania. I’ve just now gotten back online after a trip to visit fellow briquetters in Uganda where we have been looking at some of the marketing questions. Lushoto is a rural area in Tanzania that has what seems like inexhaustible supply of trees as it a montainous, afromontane forest area that is also the location of a number of government-run tree farms. There are a number of forest reserves in addition to the tree farms, and many people utilize these forests for firewood and charcoal production as there is little to no monitoring of the forests and these reserves historically belonged to the locals here and many still (in my view rightfully) view these resources as their own. Lushoto has also been the center of a lot of reforestation projects as over the past century there was intense deforestation during both the German and British colonization and now this continues simply because of intense population growth. The local fuelwood market revolves around charcoal and firewood, and much of the firewood is collected freely by women and children. In the more remote villages, the only fuel used is in fact firewood and people really only buy this when they don’t have the opportunity to collect themselves. Thus the market for alternative fuel is quite limited. We began LF-style fuel briquetting here in April at the request of local organizations focused on environmental and business development issues (organized under the Environmental Enterprise Development Initiative, started here in with the support of the organization I work for, EcoVentures International). The project was titled an “action-research” project to determine if there is viability for the technology here. I had my own doubts, due to the local situation sited above. I was quite surprised at the success of the technology locally though. The technology was introduced to five villages in Lushoto through training village community banking groups in each location. The members of these groups, who previously were using firewood and charcoal at very low price, now produce briquettes to use in their homes. The local market in the villages has yet to be fully accessed, and I don’t think that there will really be a viable market for the briquettes for some time, but the fact is that now rather than cutting trees and using charcoal, some 30 families in each village are now using briquettes as an alternative fuel. Additionally, two community members have bought their own presses to use in their homes and sell briquettes on the local market, another savings and credit group has bought a press to access the Lushoto Town market, and a Sister at the local Montessouri school has bought a press to provide fuel for their hostel. Despite this local growth, the real market is in the urban and peri-urban areas. We have demonstrated the technology at Tanzania’s international trade fair and national agricultural fair, and the market has shown to be so strong that the local District Commissioner has plans to ship the briquettes to Dar es Salaam on a weekly basis. Additionally, a number of local groups that saw the technology at the different fairs have requested training in the technology to directly access these markets through production closer to the urban and peri-urban centers (Lushoto is around 6 hours from any major urban area) and we will be conducting trainings in Arusha and Dar es Salaam over the next two months for these groups to start. They will be investing themselves in the machinery as they see such a strong business opportunity with the briquettes. I hope that this example helps to answer your questions both about the briquette technology viability for local use in an area primarily using firewood as well as the sales potential to urban/peri-urban markets. You are very correct to note that marketing is an important part of accessing these markets and this can be one of the more difficult aspects of starting the briquettes as a viable business opportunity. However if the quality and the price is good and one does some initial free distribution to allow consumers to test the product, you will find yourself with clients rather quickly, as we have seen in Uganda. The first adaptors typically seem to be hotels and restaurants which spend a lot of their income on cooking fuel. If you are close to an urban market and have the ability to do some marketing, as you have noted, I think that this style of briquetting could have great potential. I hope this helps you to figure out your way forward. I’m happy to answer any other questions you may have. Very good questions those, my own answers to your questions are bulleted below but again, perhaps it would be better to get ahold of David to do so. Also here is a link to our briquette network set up by a peace corps volunteer working in west africa...It is started only a few months ago but has experienced participants who can answer your questions far more broadly than myself. Proposal: it was for that amount and indeed most went to travel and local costs but I would agree and encourage you to seek out David to handle it for the very reasons you suggested. It would simply cost far less. There is also a one Mr. Sanu Kaji who heads the Foundation for Sustainable Technologies (FoST) in Katmandu Nepal whom you might want to contact. On marketing, I pass this to particularly a one Megan Hill and Hande Mwanjela in Tanzania who is actively spreading the technology with groups whom we just trained. The marketing issue is one of their prime foci at this time...As well Mary& Francis Kavita, Bizu Kanji and Charles Onyando are active in marketing of their briquettes in Kenya as is Shem Ewichu in Uganda. These persons and many others in other parts of Africa are all connected to the network and hopefully they all have their own experiences to share with you. Sorry for the GEREs contact: I thought they were making our style of briquette. Generally they have a more direct market in the urban areas. The rural areas always seem to manage to scrounge some sticks and twigs despite abject lack of "wood". One is often faced with the task of selling the briquette where fuelwood, even twigs, corn cobs etc., are free. We very much believe in the market driven approach and will look in depth to a certain economic viability before proceeding with training. Note however that the time between training and mastering of a market ready product for ones own area can be several months however it is rare that the trained group proceeds directly to market, even they will already have produced a briquette which they demonstrate at said market during training. I'd kindly ask the rest of us to respond to your questions for a fuller response than just our own to enable you to decide how or if you want to proceed. Thank you for your response and for the introduction to David. His work is exactly what we are trying to implement at the Life Skills Training Center at our school in the Southern Cardamom Mountains of Cambodia and I hope we can connect. My apologies for confusing communications. We moved in the last month and I have lost track of your correspondence with Andre (not Andrea) that I was copied on. Andre and I decided that he would focus on the perma-culture agriculture project and I would correspond with you directly about the briquette workshop program. Can you please send me your proposal again. I am unable to get a hold of Andre at this time. My recollection is that the workshop would cost $15,000. I assume that a good portion of that is travel for your staff from the US? If it was possible to hire David would it be more economical? Unfortunately an alternative cooking fuel is only one of many pressing needs at our school, and I am in the unenviable position of prioritizing a limited budget. The forest destruction, however, affects everything. I did buy the briquette manuals and I took them to the village leaders, who are extremely interested to learn this technology. As an educational exercise, I can see immediate value. I am not certain however, if this can be a valuable enough commodity to sell in the city in place of woodsticks. That is currently how almost everyone makes a living, selling woodsticks to the city for cooking, and it also causes children to drop out of school in third grade to work cutting down trees. We envision a marketing campaign that involves demonstration shows with music, dance and drama – an effective way to communicate with illiterate Cambodians. Our Life Skills center is teaching several marketable skills and products, the briquettes would be just one among them since everyone is already in the “cooking fuel” business. I visited at length with the folks at GERES. The problem with the improved cookstoves and improved charcoal is that it does not provide an economic incentive for the people in the village to stop chopping down trees and turn to a different way of making a living. The problem with the chardust briquetteing process that Robert sent me is that is involves more complicated “industrial” technology that doesn’t apply easily to the village situation. Which leaves me trying to figure out two things. 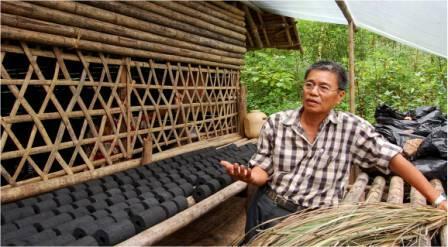 Is the bio-mass briquette a viable alternative cooking fuel beyond village subsistence for sale to an urban market? Can we get people to convert to using them? (using music/drama demonstrations and the TV media). If the answer is yes, then it is well worth the allocation of our funding. If it is more of an educational experiment in this particular setting, then I’m not sure how best to proceed. Thanks for your communicaiton but I am a bit confused as I look over the past communicaiton with Andrea. I am effectively sending you the same information sent to him back in February. That is reiterated below. We had also prepared a proposal to training your school but I understood from Andrea that this was seen as far to costly. There are two possibilities David Sawwah and the french GERES ngo. David Sawwah is a refugee , a trained engineer, and inenious trainer in the Kareni camp of northwestern thailand. He has since my com to Andrea, been allowed to move outside the camp to do training on occasion. He would to my mind be your best contact . Below is his recent article published in a door magazine. The population of Karenni State in Burma is estimated to be 300,000, according to David Sawwah, a Karenni refugee in Camp Number 1 in Mae Hong Son, Thailand. David is a highly articulate, intelligent middle-aged man with a degree from Rangoon University and another degree in mechanical engineering from Bochum University in Germany, where he was awarded a scholarship 25 years ago. David, who should be lecturing at a university or making a tidy fortune in a large corporation, spends his days working with the Karenni Development Department in Camp Number 1 as a technical advisor, specifically looking at ways of improving refugees' food security. He teaches people about environmental health, rural reconstruction, water and sanitation and the use of appropriate energy. Of the four main Karenni ethnic groups: Kayah, Kayan (famous for the Burmese long-neck women, who wear brass rings around their necks), Kayaw and Paku, 63 per cent are subsistence farmers. David wants the people in the camp to protect their farming skills and so he concentrates on organic farming and renewable energy. He wants to educate people about how to save the forest, he said. David introduced small scale bio gas production and hydro-power for electricity for the more than 22,000 Karenni refugees in Camps 1 and 2. He also advises on farming techniques that work on the mountain slopes of the camp, contour farming, soil and water conservation and how people can use waste sacks for what he called "vertical farming." Another favourite of David's was what he dubbed "guerrilla gardening." This was a round bamboo frame covered in crops but designed to look like natural foliage so the IDPs (internally displaced people) inside Burma could hide it from the military. Just where did David get all these skills, we asked? "There are many traditional people here. I learned more from them than they do from me," he explained. "I am like a telephone operator: I connect the traditional ways with scientific methods." David's tour included container gardening in woven bamboo baskets, circular beds of fruit such as banana and papaya around trees and the creation of a new energy source through the use of waste paper and decomposed leaves to make fuel briquettes. In typical David fashion, we got a little bonus tip about the fuel briquettes: "Add a little lemongrass and it will drive away mosquitos – this is an anti-malarial briquette!" The heat capacity of these briquettes might be 30 per cent less than charcoal briquettes but they were perfect for cooking, David added. His use of hydropower created electricity for use in the camp's Ban Tractor health clinic. It was amazing to see the self-sustainability and organisation of these refugees. Instead of sitting around and feeling sorry for themselves or waiting for NGOs to provide, they decided to provide for themselves using the natural resources at their fingertips. With some 20,000 people living in close proximity, water and sanitation were key for good health. David explained that the making of latrine bowls was one of their most important tasks. Camp number 1 now has 99 per cent latrine coverage and 98 per cent of homes had a pour and flush latrine, David said proudly. These were all made in the camps by the refugees, as were solar cookers and clay stoves for cooking. More than 10,000 of those were made in the last five years. Intensely proud of his work, David explained that he had always wanted to work in community development but was unable to do so in Burma so when his village was sent to a relocation site ten years ago he decided to leave. David has four children, the eldest of whom is married at 25. Another child, now 22, fled with David to Thailand. "I got married in the jungle and my youngest child was born in the camp," said David. "Kids born here recognise that they are Karenni people but soon forget things like how to plant food because they get food from the TBBC (Thai Burma Border Consortium, Trócaire's partner). Now they just want to learn computers!" Children born in the camps needed room to grow, David said. "It's not only about survival. The more they learn the more they want to learn. We must have change to give them room to grow. Everyone thinks about the future. In the long-term there's no future here. The coming generation – the more they learn – their expectations are higher." David would love to go home to Burma some day. "I study the poorest people here and their survival ways. I would like to apply those in the poorest parts of Burma. But wherever you are you should do good things for the community." While he was optimistic about the prospect of going home, he couldn't foresee when that might happen. "It's very important that our culture is protected, that we sing songs. Some people write music here that goes back across the border." Some refugees also go back across the border, delivering the training in Burma that David delivered to them. "Here in five years I have trained 5,000. Many cross the border to pass on that knowledge," he acknowledged. There were positive and negative aspects to camp life, he said. "We cannot practice our traditional ways of living, we cannot go freely, cannot forage. But everything is provided here. Most parents know the value of education here. In their villages they didn't need to send children to school but here they do. There's more health care here. But it would be better to be at home. Even if we are poor we are free." The other reference came through a one Robert Deutsch who has apparently had contact with you and who has mentioned a french NGO called GERES, which is apparently active in briquettemaking. I hope this helps you and can only assume that Andrea is no longer with you or ? I am contacting you regarding the Legacy Foundation biomass briquette training. I’m the sponsor of the school in Cambodia that Andre Carvalhaes has been corresponding with you about. Deforestation for cooking fuel is destroying the villages that our school serves, particularly the ancestral lands of the Souy Hilltribe (forest dwellers for centuries whose culture will disappear with the trees) The situation is quite desperate. Unfortunately chopping down trees is the only thing anyone knows how to do, and it often requires the labor of the children who drop out of school in 3rd grade to work. We are implementing a Life Skills training center behind the school to give the students, teachers and their families an alternative means of income. Among these skills are perma-culture agriculture products, water conservation, music & dance, English, ecotourism lodge, and alternative cooking fuels. The village leaders are very interested in the briquette process. Can you please tell me if you have anyone working in Cambodia, or the region? What is the process to get a workshop started? You received this message because you are subscribed to the Google Groups "Fuel Briquetting" group.